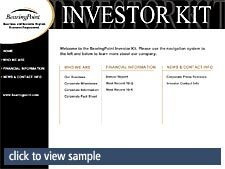 Investor kits are a basic component of any serious IR program. These packages contain materials that cast your company in a positive light and get your message across to shareholders and potential investors. Contents may include a cover letter, a corporate profile, annual and quarterly reports, recent press releases, and reprints of articles, interviews, and analyst reports. When attractively organized and packaged, investor kits are a great tool that can be used in a variety of ways. IR Solutions has created a turn-key solution that has revolutionized the way investors interact with your financial and investor documents. Transform your most important shareholder documents into an accessible and engaging interactive experience for all your investors and analysts. IR Solutions Interactive Investor retains the aesthetic integrity of your printed documents while offering you a new and inexpensive way to distribute your investor kit or annual meeting documents. All kits are designed for use online and to be printed to CD's.